Disco Debris is an interactive sound installation. 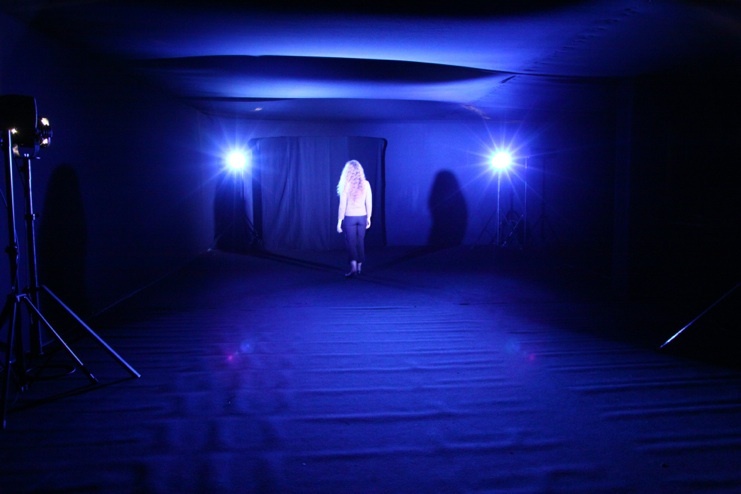 In a dark and phonetically isolated room, four projectors delimit a defined space in an indistinct, black environment, by illuminating it with a cold, blue light. Four loudspeakers broadcast Cypriot and Greek music of the 1970s. When visitors enter the lit area, a camera captures their movements; these latter, processed in real time, reconfigure the sound track which then starts to malfunction, producing scratches, fragments, and shards of voices. At the same time, visitors are dazzled by the lights of the four spots. So it is within the sonic matter that the space takes shape, through the visitors’ movements. In the space of the work, which has no visual landmark, “people stumble on a landscape of frozen voices, on excerpts of pieces of pop music from the 1970s which are barely recognizable, on broken disco rhythms, like echoes of an invisible space” says Yannis Kyriakides. The visitor’s body becomes a “playback head”. The empty space, which is sensitive to slight movements, and which people tend to walk quickly across to move into and out of the lit field, means daring to remain in the light of the spots, and risking improvised choreographies. Disco Debris thus conjures up the abandonment of Varosha in 1974. The discotheque becomes the symbol of the period prior to the invasion, when that Cypriot town was a favourite spot for carefree, night-owl youth. The dance floor right now is an abandoned space, littered with noisy rubble. The installation underscores the synchronism between the optimistic hedonism that then went hand in hand with economic and tourist growth, and the political violence of the same period. It also makes it possible to have the experience of a space in virtual ruins: visitors move forward among these sounds that have been frozen for years, as if among debris that carries within it the time of glorious years now at a standstill. From a musical viewpoint, the installation uses and quotes the international standards of the popular culture of hit parades to produce, using random mixing, a special, dissonant form, at once contemporary in its sonic references, and performance-related in its distribution. This uniformization of the music of night clubs, symbols of westernization and thus of Cypriot modernity in the 1970s, echoes the modern international-style standardization of Varosha’s architecture. The ruins of the ghost town provide a background for this discotheque debris.